Polycom is an American multinational corporation that develops video, voice and content collaboration and communication technology. The firm employs approximately 3,800 employees and had annual revenues of approximately $1.4 billion in 2013. It is the largest pure-play collaboration company in its industry. The company also licenses: H.264 video codecs, Siren codecs, session initiation protocol, native 1080p high-definition cameras and displays, native 720p and 1080p high-definition encoding/decoding, low-latency architecture and low bandwidth utilization, wideband advanced audio coding with low delay (AAC-LD), multichannel spatial audio with echo cancellation and interference filters to eliminate feedback from mobile devices, and inter-operation with legacy video conferencing. 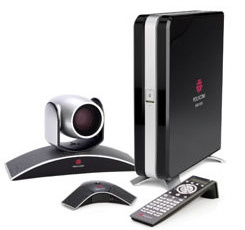 Polycom Real Presence™ Experience High Definition (RPX™ HD) is an all-inclusive solution that comes complete with the environmental elements and integrated technology required to create a fully immersive telepresence experience. The environment assembles as a "room-within-a-room" that requires no building permits and very little make-ready by the customer. The RPX series offers a range of configurations supporting different capacity levels, which allows the solutions to be used for applications beyond just meetings, such as telepresence classrooms, interactive training centers, etc. The RPX HD 400 Series accommodates from 4-28 participants with a cinematic 16 foot video wall. The RPX HD 200 Series accommodates 4-18 participants in a more intimate setting while still providing a cinematic view of up to 8 feet. The RPX HD solutions are based on open, visual communications standards and offer interoperability with many other standards-based visual communications solutions. With high definition video, StereoSurround spatial audio, and high resolution content displays on attractive multi-purpose conference tables, the RPX series delivers high technology with flexibility. These conference suites have also been designed to maximize facility space by allowing the room to be utilized as a traditional conference room when not being used for video communications. RPX solutions "natively" interoperate with other standards-based video conferencing systems and thus provide important investment protection for organizations with existing video conferencing systems. Polycom Telepresence Experience™ (TPX™ HD 306M) [pictured left] is a unique free-standing solution with an independent video wall and multi-purpose conference table. The TPX HD 306M features three 60-inch plasma displays, seating for up to 6 participants on video or 12 participants if used as a traditional conference room. The solution offers high definition video, StereoSurround spatial audio, and high resolution content displays. TPX is based on open visual communications standards, enabling it to interoperate seamlessly with Polycom RPX and HDX solutions, as well as other standards-based video conferencing endpoints. There is no on-site construction needed with the TPX HD 306M and it can easily be disassembled and moved to a new location, leaving the original room intact. Polycom HDX Series - Polycom has expanded its definition of telepresence solutions to include its HDX line [pictured right] of visual communications solutions for executive desktop, small, medium and large conference rooms and custom, integrated room environments. These solutions interoperate seamlessly with the RPX and TPX line and offer the same HD video, voice and content-sharing capabilities without the environmental room components. The HDX 9000™ Series is designed for large and custom meeting environments and meets the needs of systems integrators with flexible input/output connection options for designing a highly customized telepresence environment. The HDX 8000™ Series and HDX 7000™ Series are designed for mainstream conference rooms and collaboration applications. The HDX 9000, 8000 and 7000 series solutions are also available in packaged dual or single-monitor configurations (floor stand or wall mount options). The HDX™ 4000 Series [pictured left] is designed for executive desktops, offices and small meeting rooms. The HDX 4000 features an integrated 20-inch LCD display that doubles as a PC monitor, a built-in camera, dual microphones, high-fidelity sound system and integrated keypad that allows users to dial video calls like a phone (also comes with remote). Polycom also offers a range of telepresence solutions designed for vertical applications such as healthcare and telemedicine, educational training and judicial applications. Network Requirements - Polycom telepresence and HD videoconferencing solutions require high bandwidth and Quality-of-Service (QoS) across a Wide Area Network (WAN) to operate. Most organizations wanting to deploy Polycom telepresence solutions will need to upgrade their WAN or deploy a dedicated overlay network for each location to support the application. Customers can typically use their existing network provider or buy the network from several of Polycom's channel partners. Managed Services - For organizations interested in outsourcing the management and maintenance of their Polycom solution(s), there are a number of firms, including Polycom, that provide managed services around the offerings. Managed services can be fully hosted outside a customer's environment or hosted within the customers' network but managed from the outside by a Managed Service Provider (MSP). This service effectively manages the customer's telepresence conferencing environment, including scheduling, launching and management of all conferences. It includes remotely monitoring the solution and conferences, also providing quick problem resolution in case problems develop. As a result, customers can expect very high success rates for all of their conferences. 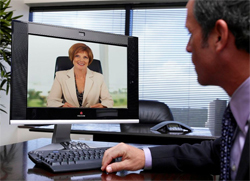 Managed Service Providers supporting Polycom telepresence include: EasyNet, Iformata, Glowpoint, and Nortel. Several other channel partners are working towards providing these services as well.